Small volumes of CFI elisa kit vial(s) may occasionally become entrapped in the seal of the product vial during shipment and storage. If necessary, briefly centrifuge the vial on a tabletop centrifuge to dislodge any liquid in the container`s cap. Certain products may require to ship with dry ice and additional dry ice fee may apply. MBS726178 is a ready-to-use microwell, strip plate ELISA (enzyme-linked immunosorbent assay) Kit for analyzing the presence of the Complement Factor I (CFI) ELISA Kit target analytes in biological samples. The concentration gradients of the kit standards or positive controls render a theoretical kit detection range in biological research samples containing CFI. The ELISA analytical biochemical technique of the MBS726178 kit is based on CFI antibody-CFI antigen interactions (immunosorbency) and an HRP colorimetric detection system to detect CFI antigen targets in samples. The ELISA Kit is designed to detect native, not recombinant, CFI. Appropriate sample types may include undiluted body fluids and/or tissue homogenates, secretions. Quality control assays assessing reproducibility identified the intra-assay CV (%) and inter-assay CV(%). Intended Uses: This CFI ELISA kit is a 1.5 hour solid-phase ELISA designed for the quantitative determination of Mouse CFI. This ELISA kit for research use only, not for therapeutic or diagnostic applications! Principle of the Assay: CFI ELISA kit applies the quantitative sandwich enzyme immunoassay technique. The microtiter plate has been pre-coated with a monoclonal antibody specific for CFI. Standards or samples are then added to the microtiter plate wells and CFI if present, will bind to the antibody pre-coated wells. In order to quantitatively determine the amount of CFI present in the sample, a standardized preparation of horseradish peroxidase (HRP)-conjugated polyclonal antibody, specific for CFI are added to each well to "sandwich" the CFI immobilized on the plate. The microtiter plate undergoes incubation, and then the wells are thoroughly washed to remove all unbound components. Next, substrate solutions are added to each well. The enzyme (HRP) and substrate are allowed to react over a short incubation period. Only those wells that contain CFI and enzyme-conjugated antibody will exhibit a change in color. The enzyme-substrate reaction is terminated by addition of a sulphuric acid solution and the color change is measured spectrophotometrically at a wavelength of 450 nm. A standard curve is plotted relating the intensity of the color (O.D.) to the concentration of standards. 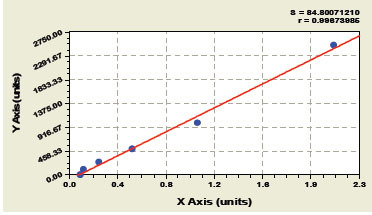 The CFI concentration in each sample is interpolated from this standard curve. NCBI/Uniprot data below describe general gene information for CFI. It may not necessarily be applicable to this product. CFI: Responsible for cleaving the alpha-chains of C4b and C3b in the presence of the cofactors C4-binding protein and factor H respectively. Defects in CFI are a cause of susceptibility to hemolytic uremic syndrome atypical type 3 (AHUS3). An atypical form of hemolytic uremic syndrome. It is a complex genetic disease characterized by microangiopathic hemolytic anemia, thrombocytopenia, renal failure and absence of episodes of enterocolitis and diarrhea. In contrast to typical hemolytic uremic syndrome, atypical forms have a poorer prognosis, with higher death rates and frequent progression to end-stage renal disease. Susceptibility to the development of atypical hemolytic uremic syndrome can be conferred by mutations in various components of or regulatory factors in the complement cascade system. Other genes may play a role in modifying the phenotype. Defects in CFI are the cause of complement factor I deficiency (CFI deficiency). CFI deficiency is an autosomal recessive condition associated with a propensity to pyogenic infections. Belongs to the peptidase S1 family. 1. Recurrent aseptic meningo-encephalitis is a rare clinical presentation of complete FI deficiency.